The newest part of the national park system: The Harriet Tubman National Historical Park in Auburn, New York. The historic Thompson Memorial AME Zion Church, a modest, two-story, frame structure constructed in 1891 is directly associated with Harriet Tubman, her family, many of her supporters and the African American community of the time. The two-story Rectory is adjacent to the Church and both structures are located across the street from the For Hill Cemetery, the location of Tubman's grave. The historic church and rectory and other structures within the boundary of Harriet Tubman National Historical Park are largely intact from the time Harriet Tubman lived and worked in Auburn. They provide a strong physical basis for telling the story of Tubman's years following the Civil War when she was active in the women's suffrage movement, in the AME Zion Church and in the establishment of a home for elderly, indigent African Americans. Auburn is about 40 minutes west of Syracuse on the northern end of the Finger Lakes, and it's about 20 minutes east of Seneca Falls. 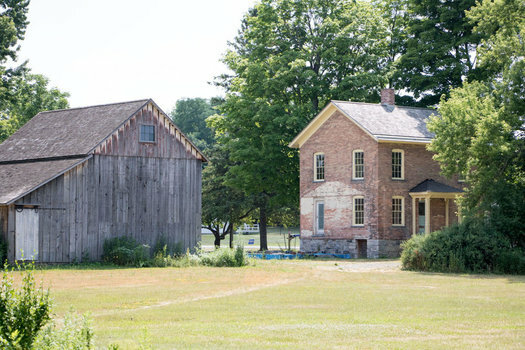 So you could easily stop at the new Harriet Tubman National Historical Park and the Women's Rights National Historical Park in Seneca Falls during a weekend trip. And you know the story about how Harriet Tubman led the rescue of a man in Troy, right?